King Daddy Lodge is the mother of luxury-living in the North Georgia Mountains. Located off of scenic Highway 60, you will reach this king-sized home after a winding adventure curving up a road through Enchanted Forest Mountain. 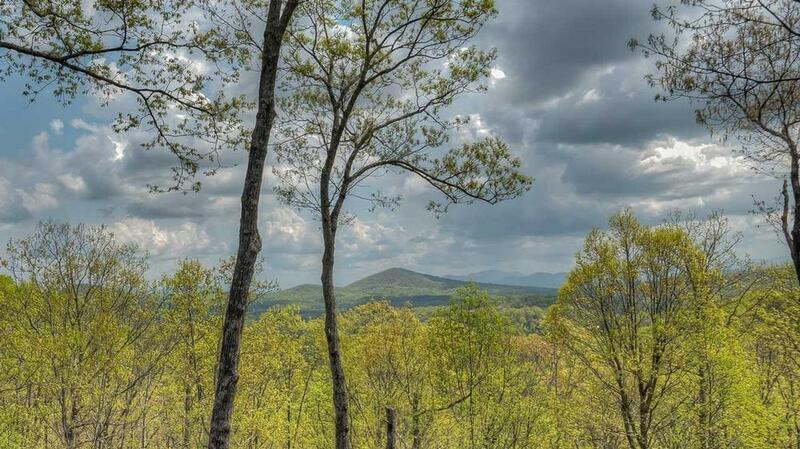 You will feel far away from the rigors of life and yet you will also be less than 30 minutes away from Blue Ridge, Georgia. Everything about this luxury cabin rental is regal, from its position at the top of the mountain to its upscale comfort and amenities. You will enjoy this home’s completely private location where no other cabins are in plain sight. The home’s enormous wraparound deck is perfectly positioned over absolutely spectacular long-range mountain views. The deck is anchored by a large stone wood burning fireplace and offers plenty of seating that invites you to relax, recharge and reconnect. King Daddy Lodge offers an open floor plan with plenty of rich leather seating and a gorgeous wet bar in the main living area as well as a see-through gas fireplace from the living room to the dining and kitchen area. The luxury kitchen has granite counter tops and plenty of cabinet space for those who want to stay awhile. It is fully-equipped and offers top-notch stainless steel appliances that will call out to the aspiring chef. With enough room for 14 guests, King Daddy Lodge offers fun for the whole gang. The downstairs game room offers a billiards table, air hockey, board games and media for the kids and adults who are kids-at-heart. Movie aficionados will enjoy a 50” Plasma TV in the media room with surround sound, a 42” Plasma TV in the living room and TVs in four of the bedrooms. Speaking of bedrooms - there is no shortage of options in this five-bedroom home – three offering king-sized beds and two offering queen-size. All rooms are private with lovely wood furnishings and soothing décor. The three and a half bathrooms all have marble countertops and the master bath offers an oversized Jacuzzi tub and separate walk-in shower with seat. With amenities galore and plenty of room to roam, everyone in your group can indulge in their own fun and their own space. Welcome to King Daddy Lodge – when living large is what you want out of your vacation. 03/19 - This home had amazing views!! The cabin was very clean and spacious for my group of 14 people. Everyone enjoyed their stay and we look forward to booking again. If you book this cabin, you won’t be disappointed! Escape to Blue Ridge is a great company. The staff was very helpful and attentive. 02/19 - Home was beautiful! 12/18 - Everything was amazing, we all loved it! 11/18 - The cabin is VERY spacious and met all of our needs. The staff are very informative and helpful. 07/18 - We love how big the home was. We enjoyed the hot tub and pool table. The kitchen was a great size as we cooked everyday. Outstanding company. 07/18 - The beds were incredibly comfortable. 1/18 - The cabin was beautiful and it had everything you think you need. We will be back. 09/17- This home is fully equipped in the kitchen. Mixers, coffee pots, crock pot, dishes, cookware. Just bring your food! Love that the pool table and hot tub were right there by each other. Love the screened in porch for outside dinners. I love that we were not bothered. This is my second time staying at King Daddy Lodge and will definitely be back!!! Staff was always pleasant and nice. 08/17- Beautiful home that is well kept and has plenty of space inside and out! Great staff! Very friendly and helpful. 07/17- The house was very spacious and accommodating to many people. We were very happy with the hands-on help we received from the staff. They were very nice and helpful any time we spoke. 04/17- Very nice cabin, room for everyone. Really enjoyed the outdoor fireplace. The people that I talked to on the phone were pleasant and helpful. 03/17- We liked the bedrooms in this home. Having three bedrooms with King beds was the reason we picked this place. We have been happy with Escape Blue Ridge. We have rented cabins with your company for the last 5 years. 02/17- Our favorite features of this home were the views, the outdoor fireplace and the spaciousness of the cabin. Very pleased with the overall experience. 02/17- This home was beautiful and well taken care of! We loved it and felt right at home! It was clean and the furnishings were very nice! The company was great and super helpful! All questions were answered promptly. We appreciate your kindness and helpfulness! We will always use you all for our cabin getaways. 01/17- We were happy with the cleanliness and location of the cabin. Courteous and very friendly staff. 11/16- The cabin has plebty of room for every memeber of the family, it comes with absolutely everything to feel like home. 11/16- The master bedroom was nice. The kitchen was big. The screened back porch was nice. Have only used Escape to Blue Ridge twice. The staff was very helpful finding a place for our stay. 11/16- The view was amazing. Overall this is still one of the best companies to rent with! 10/16- The cabin has a wonderful view and a great outdoor fireplace. Karen booked our reservation, and she was the BEST. We had booked with another company months in advance and when we got there the cabin was filthy and horrible. At the last minute, Karen was able to get us a reservation that night. She is a great employee and was so thoughtful. 09/16- My siblings and I enjoyed everything about the cabin. It was beautiful. Very professional company! 08/16- Enough bedrooms to accommodate our group. Clean & Well Stocked for our arrival. 07/16- Everyone in our large group enjoyed our stay at King Daddy Lodge. There was plenty of space of everyone. We enjoyed the game room, large deck area and outdoor fireplace. This is the fourth vacation I've scheduled through Escape to Blue Ridge. I find the staff professional, friendly and very helpful. The only improvement would be the policy for method of payment. With a large party each paying their portion of the rental, it would be much more convenient if individual credit cards would be processed instead of limiting to two. 05/16- The home is very welcoming...lots of space for everyone to enjoy! We love the downstairs area! The new air hockey was a great addition. 03/16- Very clean cabin. Great company with good customer service!! 03/16- Comfy bed, plenty of room, well equipped kitchen. I enjoyed my weekend and the reservation was straight forward and house was nice! 02/16- The fireplace and look of the cabin! Great group and you help make my birthday fun!!! 02/16- Our favorite things were the number of bedrooms & bathrooms, pool table, hot tub, the mountain view, multiple fireplaces. Everyone I spoke with from the day we reserved to the day we arrived was very polite and helpful. 01/16- I enjoyed every aspect of this home! The company was great! 12/15- The Spacious settings, the comfortable bedding, a luxury homey feel. Full working kitchen. Great company!!!!!! Will definitely be back next year and the year after! 11/15- A very well laid out home with outside fireplace (covered) at the front door. Great view out the front of house. Rooms were great size and the beds very comfortable. Very roomy and well stocked kitchen. A wonderful home for 6 adults and 4 children under 10 yrs of age who had the downstairs rooms to themselves and loved it. Really enjoyed the push button fire igniter in the see thru fireplace in the dining/living area. Company was communicative and answered all our questions quickly. Great emailed updates with valuable information. Mike stopped by to blow leaves and we had a great conversation with him. Also, upon arriving the cleaning woman was still there finishing up (we were 30 minutes early) and she was very informative and went out of her way to make sure we had everything we needed. Sharp young lady and I hope she pursues her dream of a Forestry degree. 11/15- The bedrooms were nice and spacious and the beds were comfortable. The back deck was also nice and the outdoor fireplace. I love your company and you guys provide excellent customer service from start to finish. 10/15- The view was just breathtaking. The entire layout of the home was fantastic. It is very roomy and comfortable. Great and friendly staff that was always readily available to help. Very smooth booking process. I will always book with your company. 08/15- Very homey feeling, but also very modern with a gorgeous view. 08/15- It had everything you need ..good..
07/15- Loved the scenery, the pool table, the hot tub - just beautiful. Great place to spend family time. 06/15- The ladies loved the front porch; the guys loved the pool table. 06/15- The size and appointments. I loved that luxury was achieved without alienating the natural scenery. Well done. Love you guys! 05/15- Outside fireplace is what we enjoyed the majority of the time there. 03/15- The view was the best feature. It was beautiful. 03/15- The distance from the other cabins...very private. 02/15- I loved the sitting area on the main level along with the master bathroom.I loved the cabin itself. Didn't care too much for the steep drive up the mountain to get there, however. Definitely enjoyed my stay nonetheless. 11/14- The number of bedrooms, the fireplace and the game room were the best features. 10/14- Other than the views, ha! Everything worked!! We've stayed in may homes, but either the TV's, DVD Players or Internet never worked properly. We were also impressed with the well stocked kitchen, even a cheese grater, yea! And, used both coffee makers every day, one for reg and decaf. There were 8 women in our cabin, loved the nice bedding and towels.The photos represented the property exactly. The web site was user friendly. Each time I called and/or emailed customer service, they contacted me back immediately. 10/14- Big rooms, big kitchen, big beds, the view when it wasn't cloudy. We enjoyed our stay at King Daddy's Cabin. The view was spectacular, the cabin has large rooms and large beds. The kitchen is laid out well and is also large. The outdoor fire place came in handy with plenty of wood to burn and nice and warm. Would love to come visit here again. Thank you for sharing your cabin with us. 08/14- The whole cabin was exceptional. No particular favorite.Overall a great place to spend with family and friends. Every employee we encounter was polite, friendly and attentive. 08/14- Loved the view, the deck and fireplace, the hot tub, living room, kitchen. This cabin needs some repairs. The top piece on the microwave is duct taped on and the door does not close correctly. The pot in the coffee maker is not the correct one and does not allow the coffee to brew into the pot but all over the counter and floor. The top of the picture frame coming down from upstairs has numerous dead bugs, and there are cobwebs throughout the house and we were unable to make the shower in the basement work. The cabin was wonderful. Very clean,beautiful and plenty of space for 14 people.